Orvis has teamed up with Trout Unlimited to create a unique and exciting fishing experience. 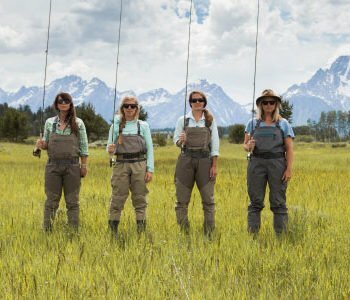 Our goal is to bring more women in the sport of fly fishing through the 50/50 On the Water initiative and we think there’s no better place than one of America’s most iconic landscapes, Montana’s Paradise Valley. 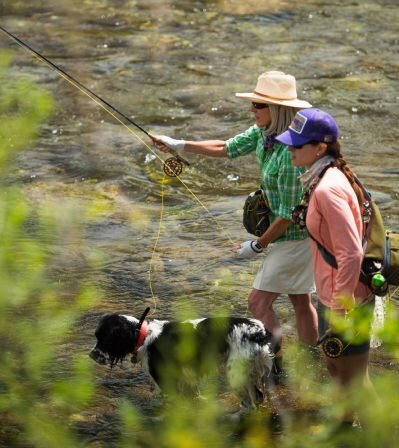 Fly fish and explore southeast Montana and Yellowstone National Park with a small group of women from Orvis and TU at Hubbard’s Yellowstone Lodge. 5% of your trip cost will be donated by Orvis and Hubbard’s Yellowstone Lodge to Trout Unlimited’s STREAM Girls Program. 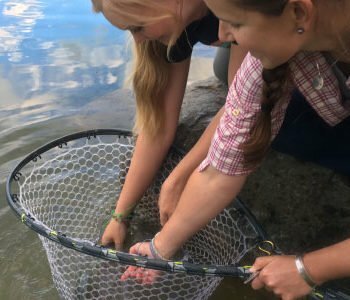 Your investment in STREAM Girls will have a direct impact on the lives of hundreds of middle school girls, women fly fishers, and TU members. You can learn more about the STREAM Girls Program at tu.org/streamgirls. YOUR HOST will be Beverly Smith, Vice President for Volunteer Operations at Trout Unlimited and life long fly angler. Marrying her two passions: conservation and fishing, she’s working her dream job helping TU volunteers across the country implement the TU mission locally. From $2,820 per person (includes a Helios 3 fly rod). Additional loaner gear is available at the lodge. A full packing list will be provided with your confirmation materials. Venue: Hubbard’s Yellowstone Lodge – Emigrant, Montana. Bring your girlfriends… wine + fly fishing! Need we say more? We are hosting our 4th annual fly fishing Ladies Night! Enter into our raffles for some BIG items… details to follow! Sign up for our Spring learn to fly fish classes at a discounted price. Women’s specific and spey casting classes available! We are proud to have two awesome women on staff and are stoked to be a part of this wonderful community. Our goal with this event is to be the go-to shop in town for female anglers… no matter your skill level! #uniteatladiesnight. Whether it’s your first time or you’re the next Joan Wulff, we want to help you start your fly fishing season off right! Women and men… we welcome you with open arms! And as always… wine 🙂 #5050onthewater. Ladies Night lanyard (handmade by FlyVines in Missoula) with your Ladies Night kit, including two glasses of wine on us! Non-alcoholic options available. No purchase necessary. All fly fishing gear is provided. Just bring yourself, your friends, extra layers to keep warm (if need be), and be ready for a good time! No registration needed, just RSVP if you are joining us! And stay tuned, we will be adding videos with all the goodies and fun to be had, leading up to the evening! 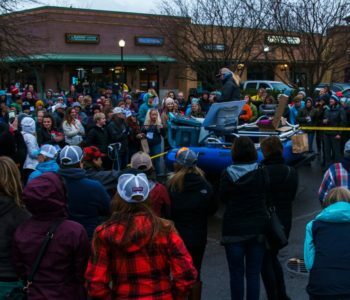 Event will be held at Blackfoot River Outfitters in Missoula, Montana. Join us Saturday, March 9th at the Gallatin River Lodge in Bozeman, Montana for a women’s wader & boot fitting! When it comes to waders, finding the perfect fit can be difficult and as a small fly shop it is hard to keep every size in stock. 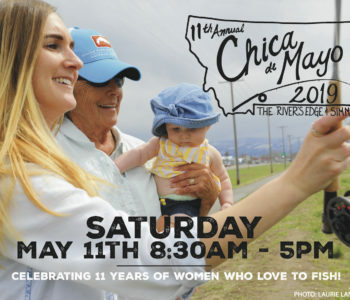 Waderpalooza is a great opportunity for women to try on Orvis, Patagonia, Redington and Simms waders. Thats right, all four brands will be represented with full size runs of boots as well! Casting for Recovery will be selling raffle tickets for the opportunity to win a complete fly fishing gear setup including a rod, reel, boots, and waders! FREE drinks and hors d’oeuvres will be provided by Gallatin River Lodge during the event. If you have struggled to find a pair waders or boots. This is the opportunity to finally get into the perfect fit & learn the differences in each brand! Reps from each brand will be there to present & assist on their waders & boots. Karlie Roland, our old shop employee will also be there to assist on the fitting. Sign Up If you live anywhere near Ennis MT (Bozeman, Butte, Island Park, Dillon, Twin Bridges, etc.) please join Jen Ripple with the Dun Magazine and Heather Hodson – Northwest Fly Girl, founder of United Women on the Fly for a fun filled evening of socializing, education and a few give aways. We want to meet as many fly sisters as we can! More Details in the near future! Location – Willie’s Distillery, Inc. in Ennis, Montana. Sign Up Take three… #thirdannual! Bring your girlfriends… wine + fly fishing! Need we say more? We are hosting our 3rd annual fly fishing trunk show… Preview and try on new 2018 gear and apparel from Orvis, Costa, and Simms. See something you like? We can special order any size, color, or featured offered! Enjoy storewide discounts to get your 2018 season up and going! Sip on a glass (or two) of wine, connect with other fishing females, learn how or improve your fly cast, and enjoy the evening. We will have plenty of fun, educating, and engaging festivities to be a part of. Fantastic raffles from Orvis, Simms, Montana Fly Company, Fishpond, and Costa and many more! We are proud to have three awesome women on staff and are stoked to be a part of this wonderful community. Our goal with this event is to be the go-to shop in town for female anglers… no matter your skill level! #weareallanglers. Whether it’s your first time or you’re the next Joan Wulff, we want to help you start your fly fishing season off right! We can help you with knot refreshers, casting practice (or kick-start your learning), and most importantly… connect you with other women for fishing, hiking, and other fun adventures! #community Women… we welcome you with open arms! And as always… wine 🙂 #505onthewater. We will have fly rods, knot tying material, every size of wader and boot to try on, and much more. Just bring your valid I.D. if you’ll be enjoying wine and be ready for fun! Price: TBD but less than $10 entry fee!